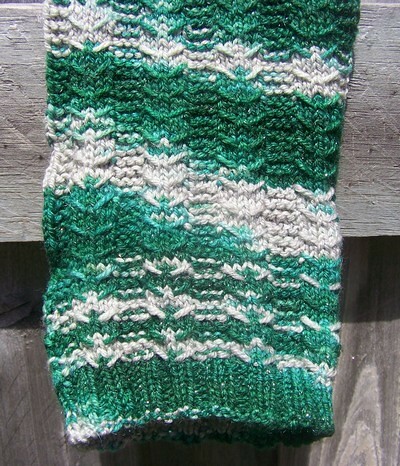 Salazar Slytherin – this pattern was inspired by the gorgeous sock yarn I found, Salazar Glam. I wanted to find a stitch pattern that would have the variegated yarn shown off well, so I knew it needed to contain slip stitches. I came across this stitch & I think it works well with the yarn. These socks are worked toe-up – instructions are written for using one circular & the magic loop method. Please adjust accordingly to your preferred method, whether 2 circs or DPNs. Calculate the number of stitches needed – measure the foot around at the instep. Round the measurement down (for example, if the measure is 8.5”, round down to 8). Multiply the rounded down number by 7.5 (the gauge) to get a number of stitches. This pattern uses a total of 64 stitches for the sock – if you need to increase or decrease, make the changes to the garter ribs rather than the stockinette/slip stitch ribs. Using the figure eight cast on, cast on 10 sts. 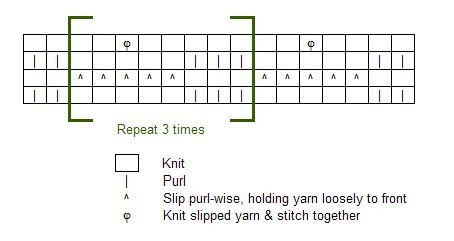 Knit the first 10 sts on one needle, change needles as needed for preferred method, then Kb 10. Change needles to return to first needle. Beginning with this row, M1 at the first stitch, K across to the second to last on the needle – M1 in that stitch, followed with one more K. Change needles and do the same increases on the second needle. Each increase round, you will be adding a total of 4 stitches. Follow the increase round with a round of just K. Continue to increase until there is a total of 60 stitches (there will be 30 on each side). Do a final round, increasing the top of the foot by 3 stitches (resulting in 33 for the top) and the bottom of the foot by 1 stitch (resulting in 31 for the bottom). One side will be the top of the sock while the other will be the bottom. 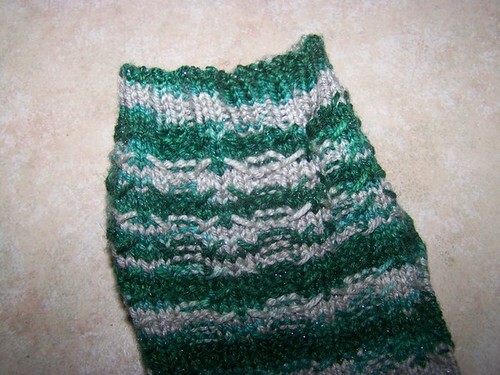 The bottom of the sock is all K – resulting in stockinette bottom. 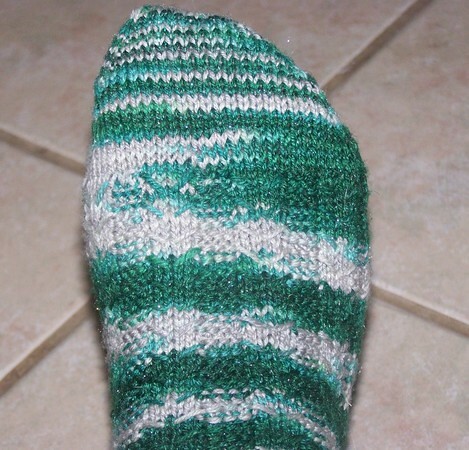 The top of the sock is worked in the stitch pattern. Continue with this pattern until the sock measures 2 inches (or 5cm) less than the length of the foot. Row 1: (RS) K30, wrap the next st. Turn. Row 2: (WS) P29, wrap the next st. Turn. Continue this pattern until there are 12 active (unwrapped) stitches left. Find the wrap at the base of the wrapped stitch. Pick up the wrap (PKWR) with the needle by inserting the needle point under the wrap, lift stitch to the needle. This action will form a new stitch on the needle. Knit (or purl) the 2 stitches together. Wrap the next stitch. Row 1: K12, PKWR. Turn. Row 2: P13 PKWR. Turn. Continue pattern until all wrapped stitches have been picked back up and the heel is fully formed. Ensure that there are 31 stitches on the heel needle. Do one full round – the needle containing the back of the sock will be done in stockinette, while the front of the sock will continue the stitch pattern. Begin stitch pattern on the back of the leg, but you will do one less stitch at the beginning & end of the needle. So where the beginning of the row would be P2 on the front of the sock, on the back of the sock, you will do P1 instead. Maintain 33 stitches on the front needle and 31 stitches on the back. Continue to the desired height, keeping the cuff in mind. Increase as necessary to shape for the calf, adding the increases on the garter ribs. Knit 2, Purl 2 for the cuff – do 10 rounds (more or less as desired). Bind off: in order to leave a long enough tail, wrap the yarn around your fingers 5 times, then cut. Thread a yarn/darning needle with the tail. *Insert the needle into 2 stitches, purl-wise. Leave the stitches on the needle, pull yarn tight, but loose. Insert the needle from left to right into the first stitch & pull yarn tight, but loose. Remove that stitch from the needle. Continue from * until you have run out of stitches. Work the tail into the inside of the sock, trim if needed. This entry was posted in Running and tagged Harry Potter, Knitting, Socks. Bookmark the permalink. 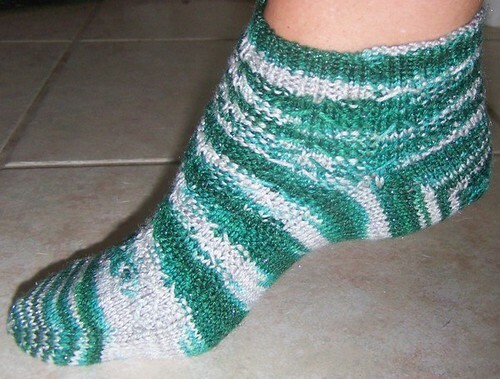 What beautiful socks – that is a great pattern and such a pretty colorway!